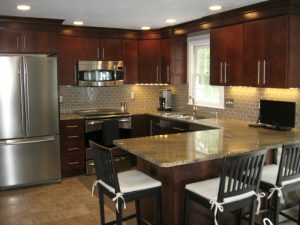 Remodeling and Custom Cabinetry | MA Restoration Inc.
What sets us apart? Our quality craftsmanship and great attention to the smallest of details. We are friendly, honest and knowledgeable and will work with you to custom design any built-in cabinetry, kitchen, bathroom or other living space to fit your home, lifestyle and budget. You care about your home and we care about it too. We go the extra mile to protect the rest of your home during the renovation. Runners and padded drop clothes will be laid from the entry of your home to the work area. If the project requires, plastic will be hung to keep the remainder of the house virtually dust-free. We’ve got it covered. We work with a small group of sub-contractors that, like us, take great pride in their quality of work. No headaches on your part – just sit back and watch as your project seamlessly comes together. We assure you that your experience with us will be a positive one. Please call us or contact us for an in-home consultation today! Check out these links for some great ideas for your next remodeling project!